Sorry but keeping the kids entertained is easy in Morzine! Keeping children entertained is pretty easy in Morzine! (Sorry sleep deprived parents..)Seeing the mountains for the first or second time creates an energy which makes all ages feel like it’s Christmas eve. Especially for the children! After the little one’s excitement for being in the mountains has calmed down each morning we have a range of options to keep them entertained. A dip in the pool, an arts & crafts session or the use of our kids club in L’Aubergade Hotel are just a few options whilst the grown ups are enjoying the mountains either skiing, biking or hiking across the winter & summer months. 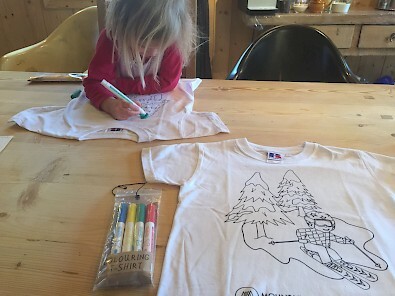 Charlotte, our chief Mini-Maverick and in-house Nanny has found that our ‘Colour Your Own T-Shirts’ are a great way of entertaining the little ones after their daily dose of the great Morzine outdoors. Simply order them at the start of your holiday, or if you can’t wait until you next come to Morzine we can send them to your home address for some home activity time. A little bit of wearable alpine life, delivered to your door! We have a range of sizes available from 3-10 yrs old in both skier & snowboarder unisex patterns. Price : £12.50 and comes with colouring in pens! Drop us a message on joss@mountainmavericks.com to organize a delivery now. 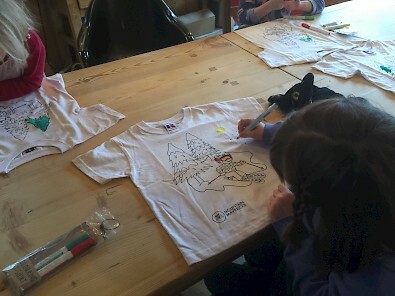 Check out the T-Shirts being coloured in here! If you are looking to get your whole family active and entertained this summer, have a look at our Mountain Mavericks Family Activity Weeks. They are jam packed with educational yet fun activities which will create a lasting memory for the whole family. Next: Summer is around the corner. It’s time to shake things up!